Hello life saver! Skin saver protector! My life has been very hectic the last few months and when Jergens approached me to test out their NEW Jergens moisturizer for wet skin, I was yes, anything to give more time in the morning. With the colder Fall weather we start to layer up and lets face it, we tend to skip a few steps regarding our skin because its all covered up...but when its date night or a special occasion we notice! We skip the shaving of the legs, pedis are not a priority and of course if running late in the morning we skip the moisturizer...you know you are guilty of this...don't deny it! 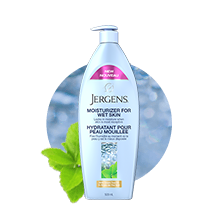 Jergens new moisturizer for wet skin will be a must every time you shower/bath because it is so easy, fast and it works. Did you know our skin will absorb moisture best when its wet and right after you shower plus if you exfoliate your skin you will scrub of that top layer of dry skin that could prevent your skin to receive all the benefit of a moisturizer. Fast and easy and moisturized skin! A Wet Skin Win! get out of the shower..be careful! pat dry your skin and go get dressed! 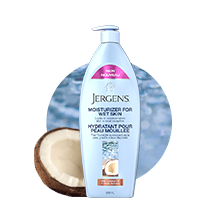 NEW JERGENS MOISTURIZER FOR WET SKIN is available now with 2 scents, with coconut oil giving you a beachy refreshing scent and with a botanical calming scent of Green tea oil. 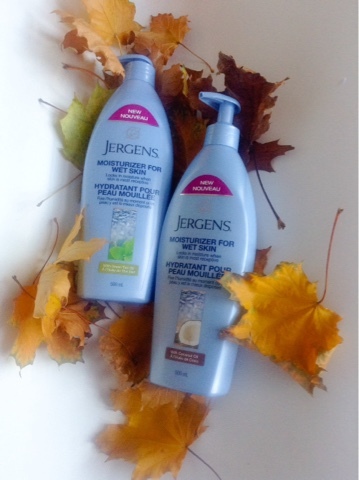 Look for JERGENS Moisturizer for Wet Skin next to regular lotions in the hand and body lotion aisle.